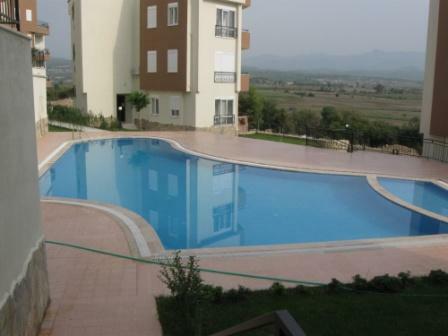 This complex is located in an area that you dream of with spectacular open views of the surrounding countryside to the Taurus Mountains. It is a paradise in which you can relax but at the same time enjoy all the facilities the complex has to offer. All on site facilities contribute to the comforts of life and include an indoor pool, fitness centre, games room, wireless internet, children`s play area, two cafe bars and 24 hour security. Car parking is also available for all residents. This three bedroom duplex has an open plan living/dining area, a fully fitted kitchen, extra storage facilities, air conditioning, spot lights in the kitchen and bathroom and PVC double glazed windows with sun/secutiry shutters. A carefully tended garden surrounds two swimming pools and a large children`s pool with waterslides. It is the perfect place to relax. For keen golfers, Belek`s new championship golf course is only 20 minutes away. Ideally located just 1km from the local shops and restaurants, 1.5km from the sandy beaches and only 6km away from Side`s town centre with its historical Roman ruins, magnificent temples and famous amphitheatre. Small local buses run frequently into the neighbouring towns of Kumkoy, Side and Manavgat.